Free item must be of equal or lesser value. Buy 1 item at regular price and get 2 items free. Add 3 of the eligible items to qualify for the discount. Vitamin E is an antioxidant vitamin that helps fight cell-damaging free radicals in your body. ** Vitamin E also supports immune function and is an essential nutrient for many cells. Just one easy-to-swallow, rapid-release softgel a day is a great way to get the E Vitamin you need to support immune function and antioxidant. ** Each serving delivers 400 IU per softgel. Our Vitamin E is made with purity in mind – so you are assured of quality supplementation. Ingredients: Gelatin, Vegetable Glycerin, Soybean Oil. Warnings/Cautions: If you are pregnant, nursing, taking any medications, planning any medical or surgical procedure or have any medical condition, consult your doctor before use. Discontinue use and consult your doctor if any adverse reactions occur. Keep out of reach of children. Store at room temperature. Do not use if seal under cap is broken or missing. Vitamin E 400 IU is rated 4.6 out of 5 by 10. Rated 5 out of 5 by Salgal415 from Great product I was looking to buy vitamins that were not in tablet form. I found the vitamins I wanted in softgels at an amazing price. Very happy with my purchase. Rated 5 out of 5 by Rainbowsky from It is a good product It does what it says on the bottle. It is a good product. Rated 3 out of 5 by pumpkinball1 from Good product Much needed during the winter. Would love to see your products with NO SOY ingredients of any kind. Rated 5 out of 5 by Tryingtobhealthy from EXCELLENT PRODUCT I've been buying this product from Vitamin World for quite some time. The quality and value of this product is excellent. 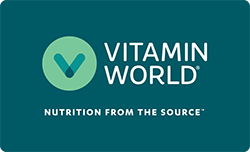 I buy a lot of my supplements from Vitamin World which include, Probiotics, Biotin, Zinc, Selenium and odorless Garlic tablets. the convenience of them delivered to my home is wonderful.